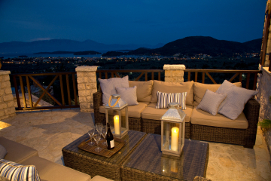 Welcome to "To Petrino", A luxury five-bedroom Villa set in a secluded and tranquil olive grove above the thriving sailing town of Nidri on the east coast of Lefkas. 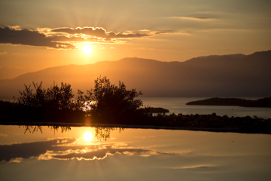 The villa and heated infinity pool has spectacular views of the Ionian Sea with its many islands and across to the magnificent mountains on mainland Greece. Enjoy browsing through the site and please feel free to contact us to check availability. 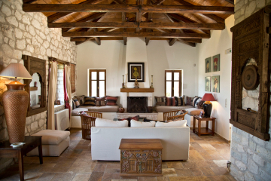 "The most comfortable and well thought-out villa we have ever been to." "The beauty of this villa and the island is something I will never forget. Stunning does not say enough. Written after sunrise on the final morning, second time around and still as wonderful." "High quality villa with amazing views. Secluded and peaceful but with access to all facilities. Everything about our stay and booking experience was great. 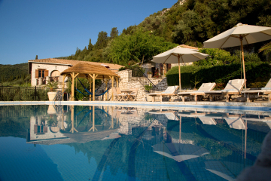 Would highly recommend this villa for teenagers."